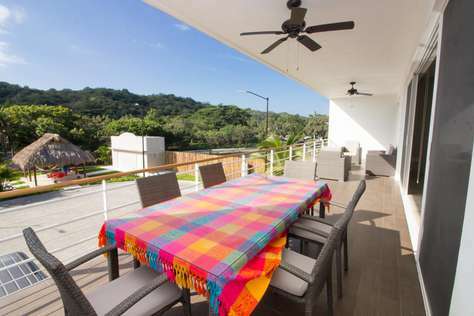 Located in the private gated community of Arrocito, Huatulco, no detail has been left out with contemporary design, modern finishing, large terrace and the beach just 2 minutes away! Enjoy the many on-site amenities including gym, restaurant and bar, botanical gardens, 5 swimming pools and direct beach access. 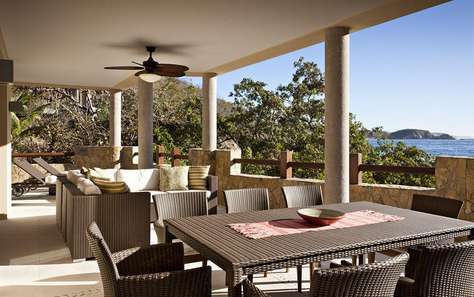 Enjoy your morning coffee on your terrace while you soak up the sunshine and breathe in the ocean breeze. Head down to the beach for a stroll at sunset or swim in the warm Pacific waters. Enjoy cooking your own meals in the fully equipped kitchen or relax and unwind in the comfortable living room while you catch the breezes off your terrace. Don't feel like cooking? Head down to the on-site restaurant and let others do it for you. Cool down with a dip in the nearby swimming pool or head straight to the development's feature 'peninsula pool' and enjoy breathtaking ocean views. This gorgeous condo is fully furnished and includes a safe and remote controlled blinds. Please be aware this development is under construction. There will be construction noise during the day. This fully furnished 2 bedroom, 2 bathroom condo is just what you need for your laid back getaway in paradise! Located in the private gated community of El Arrocito, Huatulco, this property offers a large terrace, satellite TV, many on-site amenities and direct beach access just 2 minutes away! Enjoy your morning coffee on your terrace while you soak up the sunshine and breathe in the Pacific breezes; or head down to the beach for a stroll at sunset. Enjoy cooking in the fully equipped kitchen or relax and unwind in the comfortable living room while you catch the breeze off your terrace. Don't feel like cooking? Head down to the on-site restaurant and let others do it for you. The living room offers satellite TV, DVD and WIFI. This property has a washer/dryer combo along with clothes drying rack. This spacious 3 bedroom, 2 bathroom, 1940 Sq Ft oceanfront condo is literally steps to the pool and beach. Located in the private gated community of El Arrocito, Huatulco, enjoy a fully furnished condo with a huge terrace and swimmable beach just 2 minutes away! Take advantage of the many on-site amenities including gym, restaurant and bar, botanical gardens, 5 swimming pools and direct beach access. There is a king bed in the master with ensuite bathroom. There are 2 queen beds in the second bedroom and double bed in the 3rd bedroom. Sleeps 8 comfortably! Bask in the beauty of the Oaxaca coast while sipping your morning coffee on the large terrace with ultra comfortable patio furniture. Soak up the sunshine and breathe in the ocean breeze on the lounger or head down to the beach for a dip in the warm Pacific waters. Enjoy multiple pools including the featured oceanfront peninsula pool just steps from your condo. Enjoy cooking your own meals in the fully equipped kitchen or relax and unwind in the comfortable living room while you catch the breezes off your terrace. Don't feel like cooking? Head down to the on-site restaurant and let the staff at Bistro pamper you. This gorgeous condo includes WIFI, safe, TV and satellite in living room and two bedrooms. This fully furnished 3 bedroom + flex room, 3 bathroom condo is located in a private gated community in Punta Arrocito, Huatulco. 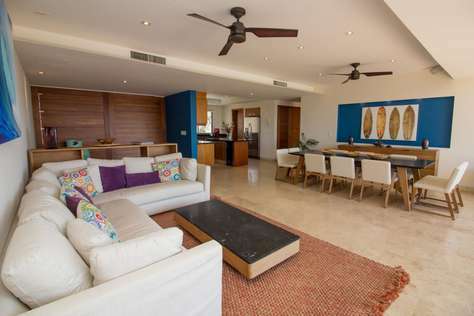 No detail has been left out with contemporary design, modern finishing, large terrace and beautiful ocean views. Enjoy your morning coffee on your large terrace while you soak up the sunshine and breathe in the fresh ocean air; or head down to the beach for a stroll or swim in the warm Pacific waters. Cool down with a dip in the nearby swimming pool or head straight to the development's feature 'peninsula pool' to enjoy the breathtaking ocean views. Take advance of the many on-site amenities including a gym, restaurant and bar, botanical gardens, 4 swimming pools and direct beach access. This gorgeous condo includes a microwave, washer/dryer, Satellite TV, 2 coolers, pool floaties and a safe. Have the vacation of your dreams in this beautiful 2 bedroom, 2 bathroom, 1940 Sq Ft oceanfront condo in paradise! 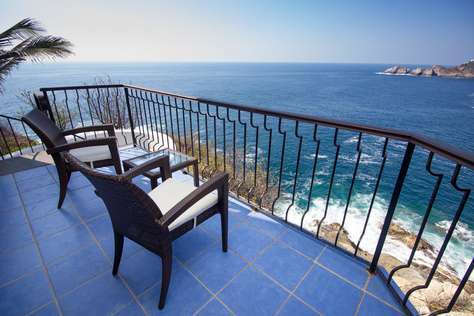 Bask in the beauty of the Oaxaca coast while sipping your morning coffee on the large terrace. Soak up the sunshine and breathe in the ocean breeze. Head on down to the beach for a sunset stroll, swim in the warm Pacific waters or cool down with a dip in the multiple pools and featured 'peninsula pool' boasting glorious ocean views. This gorgeous condo includes WIFI, 2 TV's, satellite, in suite laundry and a safe. - Water activities including boat tours, jet skiing, whale-watching, snorkeling, scuba diving, deep sea and sport fishing, bay excursions, waterfalls and rafting. Take advance of the many on-site amenities including a gym, shared BBQ area, restaurant and bar, botanical gardens, multiple pools and direct beach access. This gorgeous condo includes a microwave, washer/dryer, Satellite TV and a safe. This fully furnished 3 bedroom condo sleeps 6 people comfortably and offers partial ocean views. The master bedroom has a king bed with ensuite bathroom. Bedroom #2 has a double bed and ensuite bathroom and bedroom #3 offers a bunkbed.The main bath is down the hall (not attached to a bedroom). 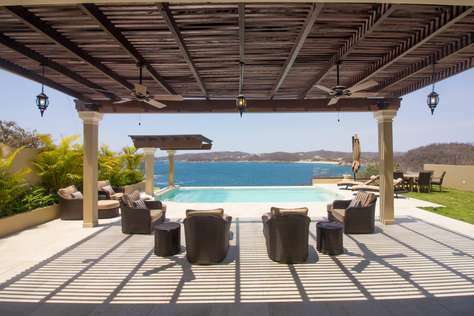 The ultimate in luxury, this villa is located in the most exclusive bay of Huatulco, has a private pool and can accommodate a maximum number of 8 people. Take advantage of the convenient on-site amenities including gym, restaurant and bar, shared BBQ area, botanical gardens, 5 swimming pools and direct beach access. 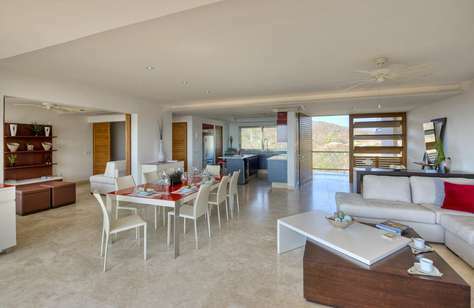 This is the ultimate luxury vacation condo for your upcoming stay in Huatulco, Mexico. 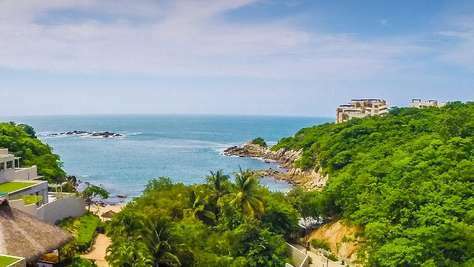 This beautiful 2 bedroom, 2 bathroom, 1940 Sq Ft oceanfront condo in paradise is located in the private gated community of Arrocito, Huatulco. Enjoy upscale furniture and finishings, modern design and a spacious terrace with unobstructed ocean views. Did we mention the beach just 2 minutes away! This gorgeous condo includes King beds, safe, WIFI, stereo and washer/dryer combo. This fully furnished 4 bedroom + den, 4 bathroom condo is located in a private gated community in Punta Arrocito, Huatulco. No detail has been left out with contemporary design, modern finishing, large terrace and beautiful ocean views. This fully furnished 3 bedroom + flex room, 3 bathroom penthouse condo is located in a private gated community in Punta Arrocito, Huatulco. No detail has been left out with contemporary design, modern finishing, large terrace and beautiful ocean views. Spectacular 2 bedroom, 2 bathroom ocean view penthouse with direct beach access and convenient on-site amenities in an exclusive gated community. Closest condo to the beach! Enjoy spectacular ocean views in this 2 bedroom, 2 bathroom penthouse just steps to the beach. Located in an exclusive residential community and gated development, this brand new top floor property offers breathtaking views and ultimate luxury. Take advantage of the 500 sq ft rooftop terrace with bar, couch, lounge chairs, and a counter with stools to sit and watch the waves roll in on the the Pacific. The perfect spot for evening cocktails and private tanning! Brand new oceanfront condo - Photos Coming Soon - Book now! Spectacular 2 bedroom, 2 bathroom 2nd floor ocean view condo with direct beach access and convenient on-site amenities in an exclusive gated community. Closest condo to the beach! Enjoy spectacular ocean views in this 2 bedroom, 2 bathroom 2nd floor condo just steps to the beach. Located in an exclusive residential community and gated development, this brand new top floor property offers breathtaking views and ultimate luxury. Take advantage of the 500 sq ft rooftop terrace with bar, couch, lounge chairs, and a counter with stools to sit and watch the waves roll in on the the Pacific. The perfect spot for evening cocktails and private tanning! Enjoy this beautiful 2 bedroom with Den (Sofa bed), 3 bath condo in the final and newest building in the very successful gated Cruz del Mar development. Relax on your spacious terrace while taking in the view of Bahia Santa Cruz and the town of Santa Cruz while being steps away from the pool and a palapa. Enjoy the beautiful views from the kitchen to the infinity pool. The unit is able to comfortably accommodate 8 people with 1 king, 2 queens and a queen fold out bed (with privacy screen), large fridge and linens. Oceanside at Cruz del Mar is a beautiful gated and finished development with spectacular ocean views. beautiful established landscaping. The development is very successful, well maintained with no building construction activity going on. This condo is the last and final building in the secure, gated development. Enjoy this new building with its open and modern floor plan. Two pools are literally 12 steps away from your terrace. A palapa with an incredible view is located next to the building and is close enough to receive your 10Mbps wireless internet signal. The unit has 4 air conditioning units and 6 ceiling fans (including the 2 terrace ceiling fans). 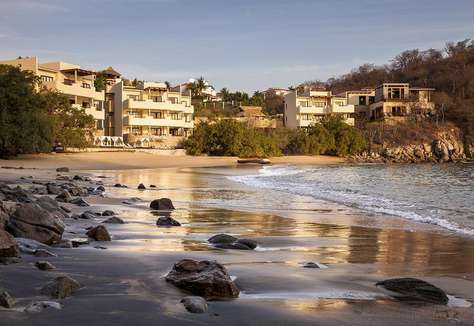 The development's fantastic location allows you to immerse yourself in the rich culture and beauty of Huatulco. Explore the nine bays and 36 pristine beaches and take in the many activities the area has to offer. You are a 10-15 minute walk to many restaurants, shops and local markets. You are also minutes to Playa Santa Cruz a beautiful beach perfect for swimming, snorkeling, kayaking, jet ski rentals, paddle boarding and dining at one of the many beach restaurants. 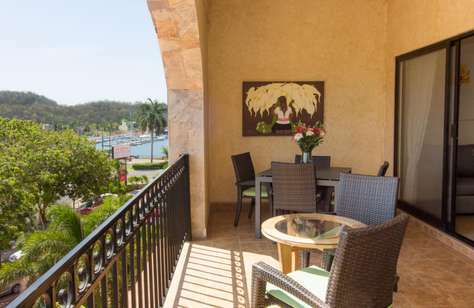 Oceanside at Cruz del Mar is a beautiful gated development with spectacular ocean views. Located overlooking Santa Cruz bay, this gorgeous condo development features oceanfront units with open living feel, modern design and expansive floor plans. Enjoy your spacious terrace, large common area and unique floor plan for flexible use. BBQ dinner in the fully equipped kitchen. Enjoy morning coffee and evening margaritas on the large terrace while you bask in the warm tropical breezes and gorgeous ocean views. The master bedroom has a king bed, the second bedroom has two queen beds and the flex room has a queen pull out sofa bed. 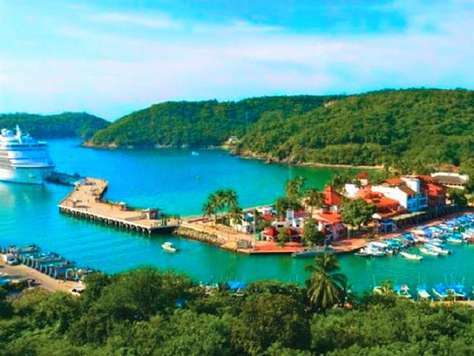 Oceanside’s fantastic location allows you to immerse yourself in the rich culture and beauty of Huatulco. Explore the nine bays and 36 pristine beaches and take in the many activities the area has to offer. The development is walking distance to many restaurants, shops, and local style markets. You are also minutes to Playa Santa Cruz a beautiful beach perfect for swimming, snorkeling, kayaking, jet ski rentals, paddle boarding and dining at one of the many beach restaurants. 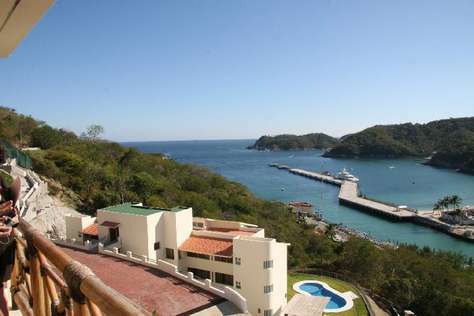 Enjoy luxury and the beauty of Huatulco in this 3 bedroom, 3.5 bathroom oceanfront condo in the gated development. Relax on your terrace and take in the beauty of Santa Cruz marina and the beautiful Pacific waters. Located overlooking Santa Cruz bay, this gorgeous condo development features oceanfront units with open living feel, modern design and expansive floor plans. Enjoy your spacious terrace, large common area and unique floor plan for flexible use. The development is walking distance to many restaurants, shops, markets and more. You are also minutes to Playa Santa Cruz, a beautiful beach perfect for swimming, snorkeling, kayaking, jet ski rentals, and paddle boarding. 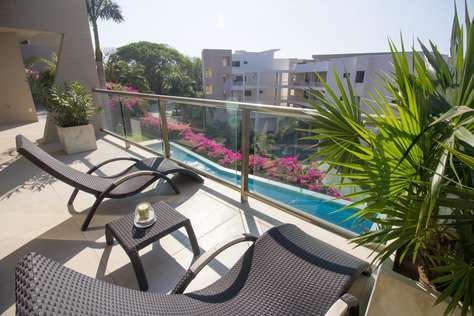 This 2 bedroom + den is located in the final and newest building in the very successful gated Cruz del Mar development. Centrally located on Punta Santa Cruz you are about a 15 minute walk to beaches, shopping, grocery store, restaurants and much more! Relax on your spacious terrace on this second level proprety while you bask in the view of Santa Cruz bay and marina along with the quaint town of Santa Cruz. Head down to the pool and cool off or relax poolside on a lounger under a the shaded palapa. Cook dinner in your spacious kitchen with stainless steel appliances, granite countertops and gorgeous tropical wood or grill up some freshly caught seafood on the BBQ while you enjoy the majestic ocean views. The unit is able to comfortably accommodate 8 people with 1 king, 2 queens and a double fold out bed in the den. Enjoy this beautiful 3 bedroom, 3.5 bath ground level condo in the gated development of Oceanside at Cruz del Mar. Relax on your spacious terrace while taking in the view of Bahia Santa Cruz and the town of Santa Cruz while being only steps away from the pool and a palapa. The property accommodates 6 people comfortably. Located overlooking Santa Cruz bay, this gorgeous condo development features oceanfront units and beautiful established landscaping. You are a 10-15 minute walk to many restaurants, shops and local markets. You are also minutes to Playa Santa Cruz a beautiful beach perfect for swimming, snorkeling, kayaking, jet ski rentals, paddle boarding and dining at one of the many beach restaurants. No detail has been left out of this brand new 3 bedroom, 2.5 bathroom oceanfront condo with contemporary design, modern finishing, large terrace and the beach just a few minutes away! 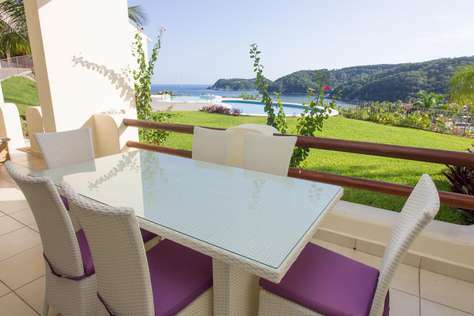 Enjoy your morning coffee on your terrace while you take in the flora and fauna of Huatulco. Soak up the sunshine and breathe in the ocean breeze with gorgeous views of the Sierra Madra mountains. Take a cool dip in the panoramic swimming pool, visit the Secret beach and coral reef below with direct beach access or stroll down to Playa La Entrega for a swim in the warm Pacific waters. Enjoy cooking your own meals in the fully equipped spacious kitchen. Don't feel like cooking? 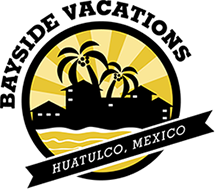 Head down to one of Huatulco's many fabulous restaurants just minutes away. New Inventory - book today! Ready this Spring 2019 this brand new 2 bedroom centrally located condo offers ocean and mountain views. Relax on your rooftop terrace with wet bar and private BBQ and cool off in your private plunge pool in paradise! You are minutes to the beach and all of Huatulco's amenities. This brand new development offers a shared swimming pool, owner grill, outdoor lounge area and community orchard. It is centrally located, walking distance to everything. 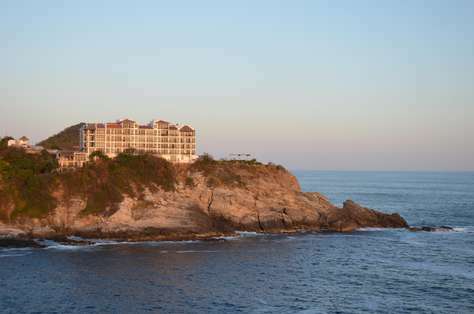 The development's fantastic location allows you to immerse yourself in the rich culture and beauty of Huatulco. Explore the nine bays and 36 pristine beaches and take in the many activities the area has to offer. You are a 10-15 minute walk to many restaurants, shops and local markets. You are also minutes to Playa Chahue and Playa Santa Cruz, a beautiful beach perfect for swimming, snorkeling, kayaking, jet ski rentals, paddle boarding and dining at one of the many beach restaurants. 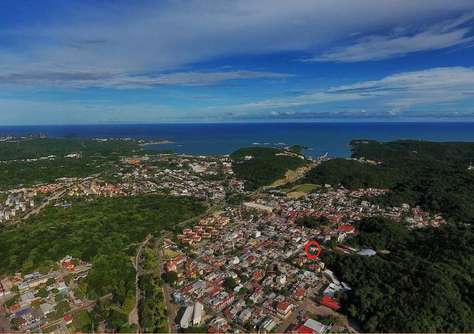 You can walk to everything Huatulco has to offer in this two bedroom marina-side condo offers access to shops, markets, restaurants and the beach. The master bedroom has a king bed and the second bedroom has two double beds. There is an in-suite washer and dryer, WIFI, Canadian satellite TV, water cooler and 2 safes in each bedroom. Enjoy the shared BBQ on the rooftop. There are also a variety of books, DVD movies and board games to play. The master bedroom has a king bed and the second bedroom has 1 double and 1 twin bed. Sleeps up to 5 people. There is an in-suite washer and dryer, WIFI, SMART TV, water cooler and safe. 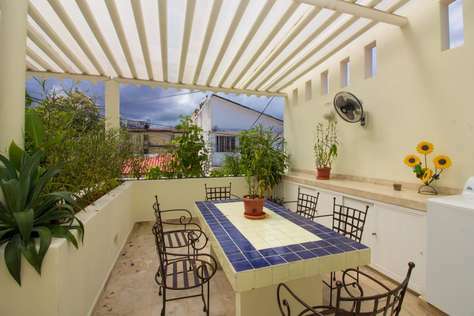 This fantastic and newly renovated 2 bed, 2.5 bath is located in the prime residential area of the village of Santa Cruz. The condominium is a few minutes walk, or approximately 200 meters from the beach, at the bay of Santa Cruz. Head down to Playa Santa Cruz in under a one minute walk and enjoy a great day on the beach under a shaded palapa soaking up the sun while sipping a cold cerveza or palapa style feast of local seafood. Take a stroll in the square and grab a coffee at Cafe Huatulco. Markets, restaurants, shops and banks are minutes away. Book a boat tour at Marina Santa Cruz and spend a day enjoying the bays of Huatulco. During the evening the square offers beautiful live music by local musicians as well as the organic market on the 1st and 3rd of each month. 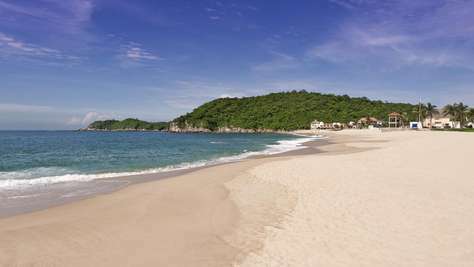 You are only a 3 minute taxi to La Crucecita or the many other beaches of Huatulco. The perfect getaway spot 2 couples or family getaway! Pricing in USD. Additional fees include electricity usage during stay. Enjoy the convenience of the beach and all of Huatulco's amenities at in this conveniently located 2 bed, 2 bath condo boasting excellent finishing touches, shared swimming pool and only a 15 minute walk to Playa Chahue. This development offers 24 hr security, elevator and 2 restaurants on-site. The master bedroom has a king bed with ensuite and cable TV. The second bedroom has 2 double beds. There is an additional bathroom with shower. There is no washer/dryer in the suite. We are happy to offer laundry services for an additional fee. There is WIFI, Cable TV in the master bedroom and living room, cooler and safe. New Inventory - Photos coming soon! Enjoy the convenience of the beach and all of Huatulco's amenities at in this conveniently located 2 bedroom + loft, 2 bath condo boasting excellent finishing touches, shared swimming pool and only a 15 minute walk to Playa Chahue. This development offers 24 hr security, elevator and 2 restaurants on-site. The master bedroom has a king bed with ensuite and cable TV. The second bedroom has 2 double beds. The upper loft has a pullout double bed. There is an additional bathroom with shower. There is WIFI, Cable TV in the master bedroom and living room. The master bedroom has a king bed with ensuite and cable TV. The second bedroom has 1 matrimonial bed. There is an additional bathroom with shower. There is a washer/dryer in the suite.There is WIFI, Cable TV in the master bedroom and living room, cooler and safe. Enjoy the convenience of the beach and all of Huatulco's amenities at Villamar Chahue. This 2 bedroom, 2 bathroom condo boasts excellent finishing touches. Walk to Playa Chahue and enjoy a beach day or have a relaxing day at the pool. This development offers 24 hr security, elevator, shared pool and beautiful gardens. It even has a private dipping pool for cooling off! King bed in master with ensuite with Apple TV. Queen bed in second bedroom with Apple TV. There is an in-suite washer and dryer, propane BBQ, WIFI,satellite TV, cooler, 2 beach umbrellas, books and games & safe in the master bedroom. Walk to amenities in this new 2 bed, 2 bath condo with swimming pool and common grill area. 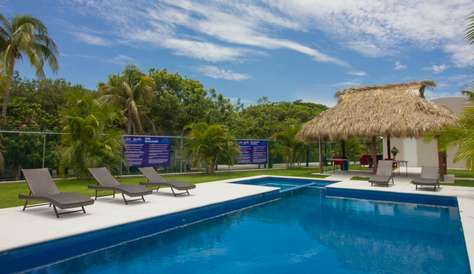 Minutes to the beach and all of Huatulco's amenities. Located in a small development in an excellent location. Situated between Chahue and Crucecita town centre, you are a short walk to award winning Chahue Beach while also being walking distance to everything that La Crucecita has to offer. This central location gives you easy access to restaurants, shops, a gym, banks, pubs, markets and grocery stores in the area. Walk to amenities in this 2 bed, 2 bath condo with swimming pool. Minutes to the beach and all of Huatulco's amenities. 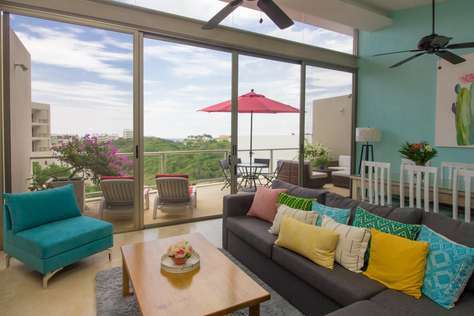 This gorgeous 2 bedroom + loft has everything you are looking for in a Huatulco getaway. The spacious living room area has comfortable seating and a double pullout couch to sleep 2, WIFI and SMART TV. Step outside on the expansive terrace and enjoy a meal outside on or lounge away while you take in the sunshine and tropical breezes. Take a dip in the swimming pool or hop on the 2 available property bicycles and head to the beach for some sun, sand and surf! The fully equipped kitchen has everything you need and more including reverse osmosis drinking water, large and small appliances, eating bar for 4, wine fridge and pantry. Located across the kitchen is a dining area for 6. The Master bedroom has a King size bed with Ensuite and terrace. The second bedroom has twin beds. Head up to the loft off of the kitchen where there are 2 additional twin size beds. There is a stacking washer and dryer inside the condo. Walk to amenities in this 2 bed, 2 bath condo with swimming pool and common grill area. 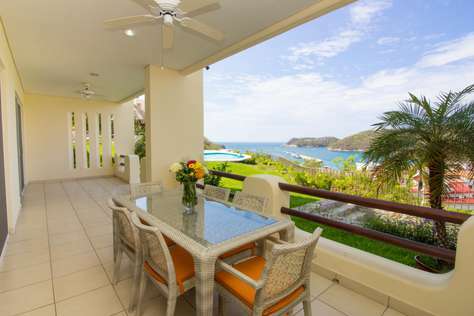 Minutes to the beach and all of Huatulco's amenities. Villa Encantanda is a luxury 3 bedroom is located in the exclusive community of Mirador Chahue, a 5-7 minute taxi to centro and 15 minute walk to the beach. The villa boasts stunning grounds and an infinity pool where you can enjoy the warm tropical breezes and sights of the Pacific blue waters. Walk in to the stunning entrance and water feature to quickly get you into vacation mode. Enjoy gourmet meals in the immaculate fully equipped kitchen with granite countertops and top-of-the-line appliances. Enjoy daily maid service (Monday-Saturday) and optional food preparation services (extra fee). There is also a propane BBQ off of the kitchen to grill up your catch of the day! The living room area has open concept, high ceilings and beautiful design. Step out onto the expansive terrace boasting comfortable loungers, dining area and infinity pool with breathtaking ocean views. This villa also offers built in stereo & security system. Rinse off after some pool time in the outdoor shower with access to the main floor bathroom. The main floor bedroom has king bed and ensuite with dual sinks and spacious shower. Head upstairs to the second bedroom with queen bed and full ensuite. Down the hall is the master bedroom with king bed and ensuite with dual sinks, spacious closet and large shower. Head out to your master terrace and enjoy morning coffee as you enjoy the ocean breeze! Relax in the cozy upstairs TV room with two comfortable loveseats that turn into single beds for children. You've never seen sunsets like this! Head up to the rooftop terrace for evening cocktails and say Adios to another great day in paradise. This is the vacation you deserve! The colonial-styled villa features a spacious master bedroom with large ensuite bathroom and generous storage spaces. There is also a futon-styled couch in the attached office for your little one. As well, the villa has a charming guest bedroom with ensuite bathroom. The spacious gourmet kitchen features stainless steel appliances and granite countertops, along with a large preparation island and pass-through breakfast bar. Help yourself from the culinary herb garden located just outside the kitchen window that overlooks the outdoor living area. The kitchen also features a stacking washer-dryer. The large dining room and comfortable living room can easily accommodate six guests with room to spare. The dining room features a cozy wet bar for socializing or gathering before dining. Outside the villa, and across from the casita, lies the refreshing L-shaped pool with built-in lounge seating and covered terrace. While the large pool receives sun throughout the day, the terrace provides cooling shade until the early evening. It is a special place in which to dine, or to enjoy the gentle ocean breezes while swinging in the poolside hammock. The charming casita was designed to be a stand-alone guest house for friends or family who stay for both long and short-term visits. It features a full kitchen, dining area and living area downstairs, with a queen-sized master bedroom and ensuite bathroom upstairs. Off of the master suite lies a comfortable balcony on which to enjoy your morning coffee while listening to the calls of exotic parrots and songbirds. A convenient shower room and separate toilet room are located below the balcony for use by guests wishing to avoid tracking pool water into the houses. There is also another laundry room. Many lush gardens and exotic fruit trees surround the property, with special lighting designed to provide a resort-feel to its occupants. Chances are some of the trees will be bearing fruit during your stay, and you will be welcome to pick various citrus fruits, mango, pomegranate, guanabana, coconut and bananas from the trees each day. Whether spending a week, month, or several months, Villa Aventura will become your favorite tropical paradise in which to pamper yourself. We look forward to hosting you and providing the special attention you deserve. This cozy 3 bedroom, 2.5 bathroom condo has a private yard where you can sit and enjoy your coffee morning accompanied with the sounds of the singing tropical birds. This condo is set in a development with shared pool and a beautiful garden area. 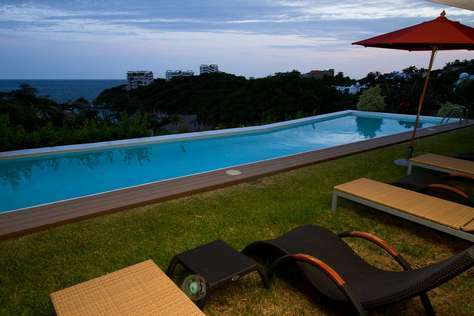 It is located in a very quite and safe area in La Crucecita, Huatulco. Only a 5 min. walk to the center of town where you can find shops, restaurants, bakery, internet cafes and the local market. 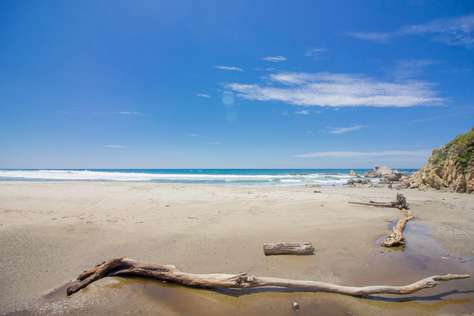 There are two nearby beaches, Chahue and Santa Cruz, which are a 25 pesos (2.00 USD), 5 min. taxi ride, where you can enjoy food, drinks, swimming, water sports and lounging. Walk to everything from this 2 bedroom, 2.5 bathroom apartment. Located in the heart of La Crucecita, Huatulco you are steps from many restaurants, shops, markets, the town square and more! The fully furnished and equipped apartment has wide open spaces full of light. There is a specious upgraded kitchen area with beautiful view of the park next door. Walk to everything from this 2 bedroom, 2.5 bathroom upper apartment. Located in the heart of La Crucecita, Huatulco you are steps from many restaurants, shops, markets, the town square and more! This cozy 2 bedroom, 2 bathroom condo is located in the heart of Tangolunda, minutes to the beach, shops, restaurants and more. Enjoy coffee on your terrace or head down to the pool area and take a dip! Walk in to the kitchen area with eating bar and stools. 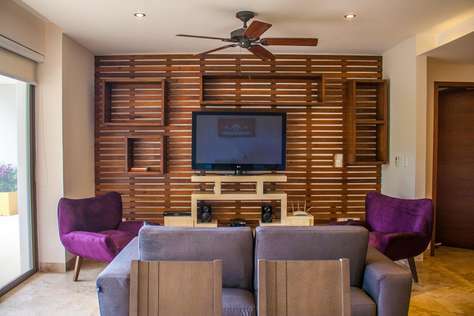 Then head into the living room area with SMART TV and terrace to enjoy morning coffee or afternoon cerveza. Each bedroom has king bed with plenty of storage space. There is also a half bathroom in the hall. Enjoy cooking your own meals in the fully equipped kitchen or head down to one of many nearby restaurants and cantinas for a refreshing margarita and catch-of-the-day. There is shared laundry services on the main floor of the development. There is an elevator. This gorgeous condo wlll be 100% complete by Spring 2019 and will include 2 SMART TV's, Safe and WIFI. 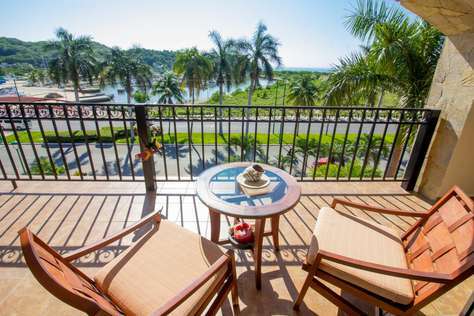 Enjoy ocean views and warm sunrises in this beautiful East facing condo. Enjoy coffee one one of two terraces as the waves crash below you in this 2 bedroom, 2 bathroom luxury oceanfront retreat. Granite counter tops, designer cabinetry, and glass tiles will bring both an elegance and comfort to your new vacation hot spot on the Pacific Coast. Chill out inside with air conditioning while optimizing views through the floor to ceiling glass only after one has enjoyed the day around the elegant infinity pool with 300 degree views of the ocean. With a King bed in the master bedroom and 2 twins in the 2nd bedroom this unit can sleep up to 4 people. Unit is equipped with SMART TV, Satellite and DVD Player. Fully equipped kitchen, including oven, dishwasher, microwave. Comfortable modern patio furniture on the terrace so you can relax with a morning coffee and watch the waves crash in. Viewpoint is non-smoking development. Smoking is not allowed in any common areas or in this unit. Please check with the rental manager on the units that allow smoking on the terrace. Children under 18 not allowed. Sweeping panoramic views, including a view over the pool from this beautiful south and east facing unit. Watch the sunrise from one of two terraces in this beautiful front facing corner unit. 1281 square feet of fine marble floors, granite counter tops, designer cabinetry, and glass tiles will bring both an elegance and comfort to your new vacation hot spot on the Pacific Coast. Chill out inside with air conditioning while optimizing views through the floor to ceiling glass only after one has enjoyed the day around the elegant infinity pool with 300 degree views of the ocean. With a queen bed in the master bedroom, 2 twins in the 2nd bedroom, this unit can sleep up to 4 people. Unit is equipped with SMART TV and Blue Ray DVD player. Fully equipped kitchen, including oven, dishwasher, microwave. Comfortable modern patio furniture on the terrace so you can relax with a morning coffee and watch the waves crash in. There is an air conditioning unit in the master bedroom and living room, not in the second bedroom (only ceiling and floor fan). Viewpoint is non-smoking development. Smoking is not allowed in any common areas or in this unit. Please check with the rental manager on the units that allow smoking on the terrace. This gorgeous 3 bedroom condo offers 1664 FT2 of oceanfront luxury with S/SW exposure and 2 terraces. The floor to ceiling windows on both sides augment the sweeping views of the Pacific Ocean. This cozy unit can sleep 6 people comfortably (master bedroom - 1 King bed, 2nd bedroom - 1 Queen bed and 3rd bedroom - 2 Twin beds) and provisions are currently being made to accommodate 2 - 4 more. The nicely appointed blinds provide privacy and assist in keeping the unit cool. Provided with all rentals is a 42" HDTV, Blueray/DVD player with satellite, fully equipped kitchen with stainless steel appliances and comfortable seating on the terrace. This 3 bedroom home is located in the quiet and peaceful community of Sector N, Huatulco, 10 minutes from Huatulco's beaches, restaurants, shopping and more. 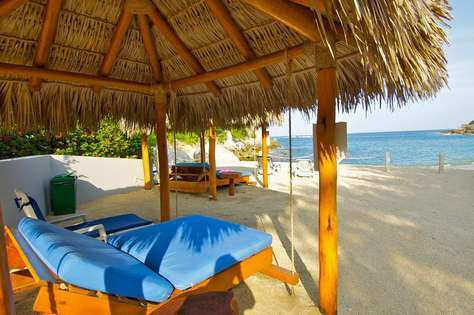 The property offers a private pool with covered palapa area and is fully equipped with everyhing you need to relax and enjoy. It offers 3 spacious bedrooms with ensuite bathrooms, a fully equipped kitchen, outdoor patio, Propane BBQ, washer/dryer, linens and cookware. A car is not necessary, however we can recommend a great car rental agency. 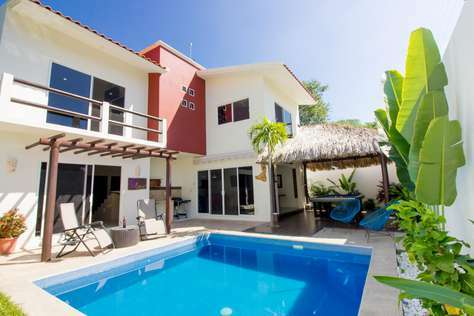 This 3 bedroom home is located in the quiet and peaceful community of Sector O, Huatulco, 5 minutes from Huatulco's beaches, restaurants, shopping and more. The property shares a huge pool with covered palapa area and is fully equipped with everyhing you need to relax and enjoy. It offers 3 spacious bedrooms with ensuite bathrooms, a fully equipped kitchen with new appliances, rooftop terrace, outdoor patio, large swimming pool, partial ocean views, washer/dryer, linens and cookware. This home is perfect for a family or three couples. It's the perfect place for long term guests or those seeking a quiet location in which to rest, relax and enjoy nature. 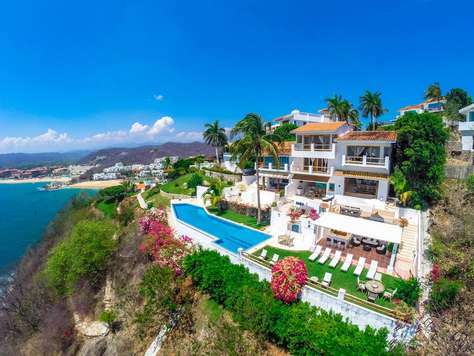 This villa is on cliff overlooking the sea in the most exclusive bay of Huatulco, can accommodate a maximum number of 10 people. This luxury condo resort development offers gorgeous beachfront views in a tropical setting. Offering 3 bedroom residences have the vacation of your dreams in a full-service resort style setting. From the moment of arrival you'll be taken care of by the on-site staff ensuring your vacation is memorable and enjoyable. Enjoy full concierge, valet, daily housekeeping, room service, spa services and a fully equipped gym. Relax and unwind in your contemporary residence. The master bedroom has a king bed looking out through floor-to-ceiling sliding glass doors that lead to the covered oceanfront terrace. Its' spacious ensuite bathroom offers amazing tranquility with its' private outdoor rain shower. The second bedroom has two twin sized beds, and a full bathroom. The third bedroom has a king bed. This luxury condo resort development offers gorgeous beachfront views in a tropical setting. Offering 2 bedroom residences have the vacation of your dreams in a full-service resort style setting. The second bedroom has two twin sized beds, and a full bathroom. The second bedroom has two twin sized beds, and a full bathroom.The third bedroom offers another king bed with full bath ensuite. 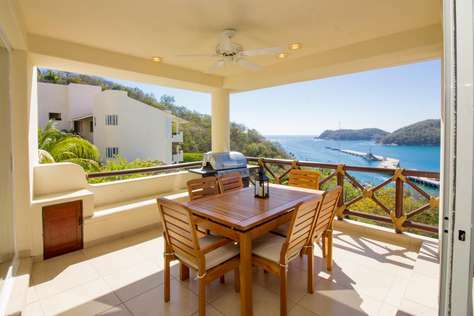 Enjoy luxury and the beauty of Huatulco in this 4 bedroom, 4 bathroom oceanfront condo in the gated development of Oceanside at Cruz del Mar. Relax on your terrace and take in the beauty of Santa Cruz marina and the beautiful Pacific waters. The development is walking distance to many restaurants, shops, and markets. You are also minutes to Playa Santa Cruz a beautiful beach perfect for swimming, snorkeling, kayaking, jet ski rentals, and paddle boarding.